Headed out on an extreme adventure, you’ll want to be outfitted with latest and greatest in jackets to protect you from the elements. The Life Tech Jacket designed by Seymourowell for Kolon Sports is the Swiss Army Knife of jackets and comes equipped with a slew of wearable technologies aimed at saving your life. Protection starts with the wind and waterproof outer Gore Pro Shell, a thermal inner layer with a body heating system, and a stretch fabric base layer that stores the electronic and battery. The jacket also comes with a personal wind turbine that can be used to power up the jacket’s heating system and other auxiliary systems like GPS. Seymour Powell worked with a number of outdoor professionals and experts to design this high-end adventure jacket. The firm consulted with mountaineers and ski guides, a Professor of human thermodynamics, an ex-UK Special Forces operative and even a Polar Explorer to find out what components were needed in order to create the most advanced coat. “The concept was born from the invaluable insights gathered by working with leading experts in extreme survival; so we’re absolutely confident that the design and features are based on solid foundations,” Seymourpowell Associate Design Director Ian Whatley said. 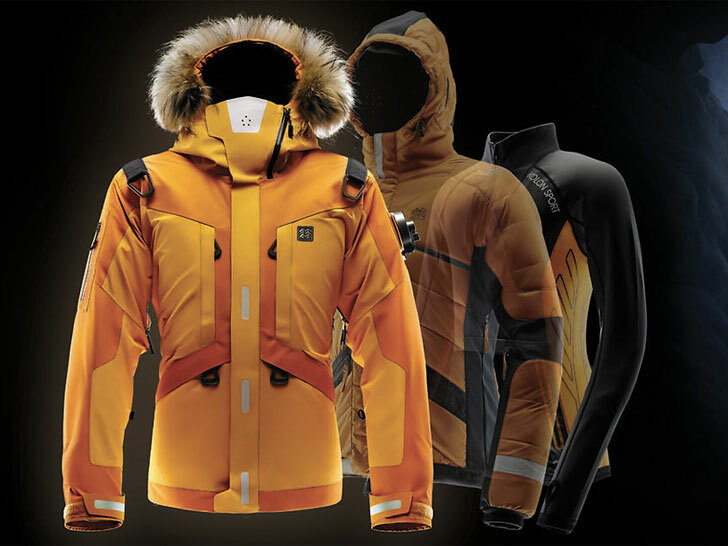 “Our design team has translated these insights into a highly desirable and compelling jacket system that sets the standard for the future of wearable technology in the extreme outdoors and winter sports categories”. The Life Tech Jacket features a tri-layered system of material that starts with the outer water and windproof shell made of breathable Gore Pro. Then in the middle, there is a thermal inner layer that features the world’s first conductive polymer heating system, called Heatex. Finally the inner most layer is a stretchy base layer that holds the electronics and battery for the heating system. The jacket is made with oversized zip pulls for easy use with gloves, shoulder and back straps to aid during rescue and a wearable first air and survival kit. Also included is a wearable wind turbine that works off the weather and wind in transit, but can also be mounted to a tent to generate power. This power can be used to charge auxiliary devices like a GPS, smartphone or satellite phone. It also charges the jacket’s Heatex System, which provides up to seven hours of life saving heat with temps of 40-50°C around vital organs. 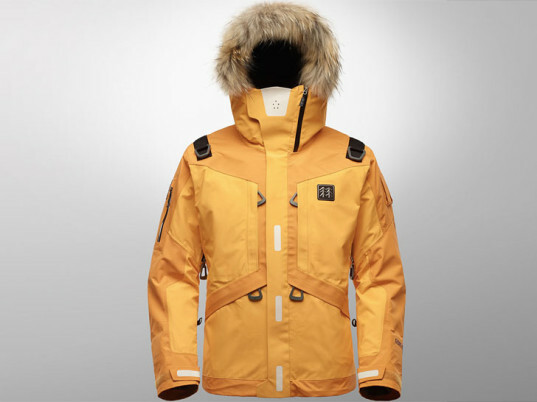 Kolon Sports began offering the jacket in their Korean stores in December of 2013. It comes in both yellow and green and retails for KRW 2,000,000 (~$US1,870). Headed out on an extreme adventure, you'll want to be outfitted with latest and greatest in jackets to protect you from the elements. The Life Tech Jacket designed by Seymourowell for Kolon Sports is the Swiss Army Knife of jackets and comes equipped with a slew of wearable technologies aimed at saving your life. Protection starts with the wind and waterproof outer Gore Pro Shell, a thermal inner layer with a body heating system, and a stretch fabric base layer that stores the electronic and battery. The jacket also comes with a personal wind turbine that can be used to power up the jacket's heating system and other auxiliary systems like GPS.